Before there was BioShock, there was System Shock 2. The first full title produced by Irrational Games when it was still a tiny spin-off from Looking Glass Studios, this terrifying hybrid of a first person shooter and RPG first came out 15 years ago today. Let's all remember in turn just how scared we were when we first stepped into the Von Braun spaceship. I first picked up System Shock 2 up after I heard about the lineage it shared with the original Deus Ex, another stellar first-person RPG. Both of these now-legendary games were heavily inspired by the original System Shock, which came out for the PC in 1994. Even by the standards of late-nineties PC games, System Shock 2 didn't look great. Its monsters were chunkily polygonal, and they moved around the game's gloomy spaceship setting in a slow, plodding way. This is just a cheap rip-off of Event Horizon, comparing it to a campy cyberpunk movie about people dying in a remote spaceship. Little did I know what was in store for me. Shortly after starting the game up and walking through the preliminary character-building section, I was dropped into the Von Braun and told by a disembodied voice coming from an intercom about what had just gone wrong. Apparently all hell had broken loose on the spaceship, and we were two of the only people left alive. I was supposed to rendezvous with this woman, Dr. Janice Polito. But doing so involved winding my way through several areas of the ship crawling with zombified versions of my former fellow passengers. I spent the next several hours hiding in various closets. Every so often, I'd peek out to try to kill off one bad guy or another whenever I summoned up the courage to do so. Then I'd jump straight back into the relatively comfort of a dark corner and wait. Very little was impressive about System Shock 2, visually speaking. But something about the game terrified me, and still terrifies me to this day every time I've revisited it. Monsters would call out with desperate whines whenever you were nearby, building up the anticipation before you ever met them face-to-face. Audio logs gave macabre clues about all the horrible things that had gone down on the ship. And pretty soon, disembodied voices would fill your ears with ominous messages about something even worse that was still in store. It was a stranded spaceship full of rotting carcasses and killer monsters, but the game still gave the impression that something else was amiss. You can see how this scene had a big impact on the career of Ken Levine, who wrote System Shock 2. He applied a similar twist to the end of BioShock's story eight years later when the game revealed to its players that the phrase "Would You Kindly" was actually being used to control the mind of that game's player character. "Would You Kindly" is now such an iconic turn of phrase in gaming that it's become a meme in its own right. I've always preferred the way that Levine applied the twist in his earlier work, however. In BioShock, the story takes a big twist close to the end of the game. This leaves the player with little to do other than work their way towards to final boss who just revealed his true nefarious intentions to you. In System Shock 2, SHODAN pulls back the curtain in the middle of the game to show the player both that they haven't been working for the person they thought they were helping, and that they're going to have to keep following an evil computer's orders if they want to make it out of the Von Braun alive and in one piece. You realize that you've been tricked. But the game doesn't stop there. It makes you live with the consequences of being duped. And then it makes you keep playing the game the same exact way, even though you now know you've been duped. Before it ever gives you a clue for how to beat SHODAN, or at least escape the Von Braun, System Shock 2 makes you feel completely and utterly powerless. And that is frightening in a way few other games manage to be. Irrational Games closed down earlier this year after it released BioShock Infinite. And Ken Levine has moved onto other projects now that he's left BioShock behind. The possibility of another true System Shock game looks less and less likely. It is it surprising, then, that fans are still trying to recreate System Shock 2's greatest scene anew? 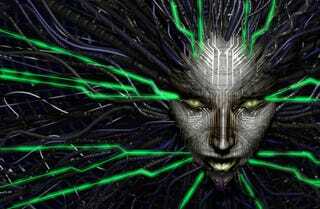 Happy birthday, System Shock 2. Thank you for all the sleepless nights.